» Design, installation, and service for commercial recording studios. » Design and installation services for commercial radio stations. » Facility design and installation of broadcast television production studios. » Custom-designed electronic equipment for professional audio and video facilities. » Design and installation of multi-media presentation facilities for business. » Business telephone PBX systems. » Local and wide-area computer networking. My business is professional Audio and Video electronic systems design, not HTML coding. Hence, I don't waste time adding swirling graphics, erratic pull-downs or popups or similar BloatWare... so these pages should load quickly on even a slow dial-up connection. Yep, it's "plain Jane", but I know that a designer/consultant who pays a "web guru" needs to charge his clients for those bells and whistles! I strive to run a Tight Ship, so my goals here are to honestly describe my abilities, provide descriptions of services that I can sucessfully perform, share technical information, and perhaps add some levity to your day! Oh my...here's a pic of me as I produced a multi image show behind the screen during a early 1980's presentation. 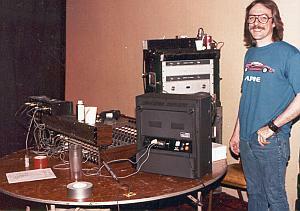 Shown is a Tascam Model 10, Tascam 4-track, and AVL "Eagle" sync units were on the scaffolding. The sounds of nine or fifteen Ektagraphics clacking were part of the show. In more recent times, I had the pleasure of spending an evening with Dale Manquen (formerly Project Manager at 3M, Ampex, and Martinsound/Flying Faders) and as he drove through Oklahoma. 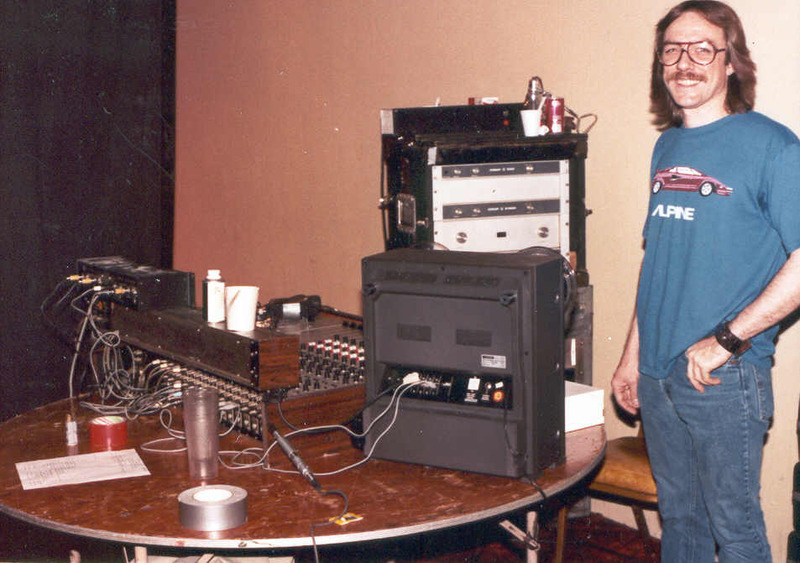 That's Dale on the left, and we both were wearing our Ampex ball caps as we toured several local recording studios. Click: for Dale's website.